1. Improvement– 2014 was the first year I even came close to training consistently. If I could get a habit of full training weeks all year long, I will improve a lot in all three sports. 2. GO! St. Louis marathon– In April I have my next marathon planned. My most recent marathon was a great experience and I think I can continue to improve on it. 3. Legend Triathlon– My second 70.3 triathlon is planned for June. Since my husband grew up near Lawrence, KS this seemed like a great race to try out. I’ve been really impressed with their preparation for this race so far. I’m a sucker for anything that is not the big name, whether it is a small business or a race that doesn’t have the big name attached to it. 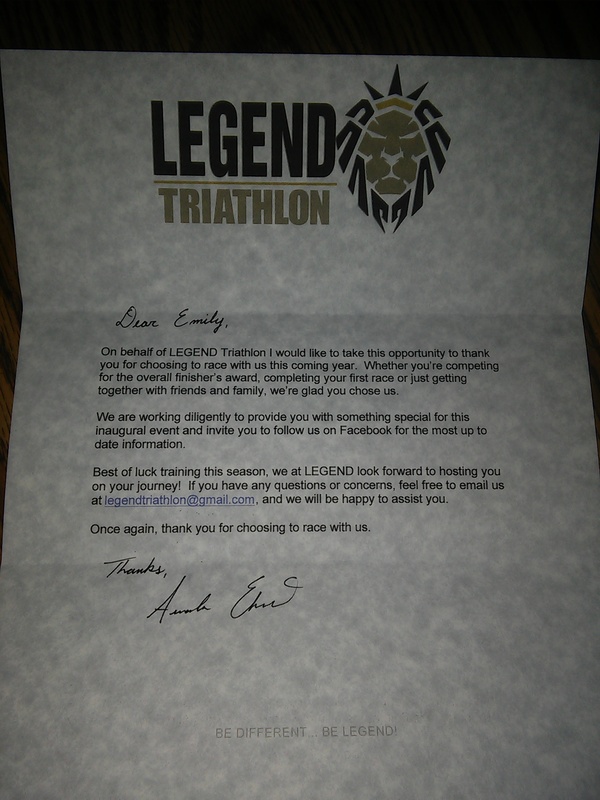 Legend Triathlon really wowed me though when they sent me a personal letter this week. Who does that!? 4. Being part of a relay team– I was chosen to be part of a relay team for my triathlon club this spring for River to River, an 80 mile race across Illinois. I’m also part of a team hoping to get into the KT82 race along the Katy Trail in Missouri. I’ve never done this kind of race before, but have watched on Facebook as a number of friends have participated. I love the idea and think they will be great experiences. 5. Ironman– I’ve been quietly considering this race since before my first triathlon. I had to really convince myself not to register for my first full ironman race before ever having done a triathlon. All that stuff I said about being a sucker for the non-branded races, I still want to have the experience of doing a branded one as well. Three times in the past month I have started to fill out the registration for this race but have stopped. At a Resolution Run at my local running store, Runwell, I got asked both on paper and on video what my resolution for 2015 was. I answered both doing a full ironman so apparently I am committed now that there’s proof! 6. Family Workouts– My husband and my kids are great support systems. They never complain about a workout I need to do, often have a meal or recovery drink ready for me when I return and listen to me babble about my training and goals. I appreciate this more than I probably let them know. However, my favorites are the times where they join me for a workout or part of it. I love sharing the experience of being active and accomplishing goals with them. My daughter seems to be drawn to longer distances, my son loves sprints and track workouts. My husband has a strong background in swimming and biking and is always helpful with providing tips or knowledge when he joins on those workouts. Although my training has to do with my goals, my favorite runs, rides and swims are when my family is there with me. 7. 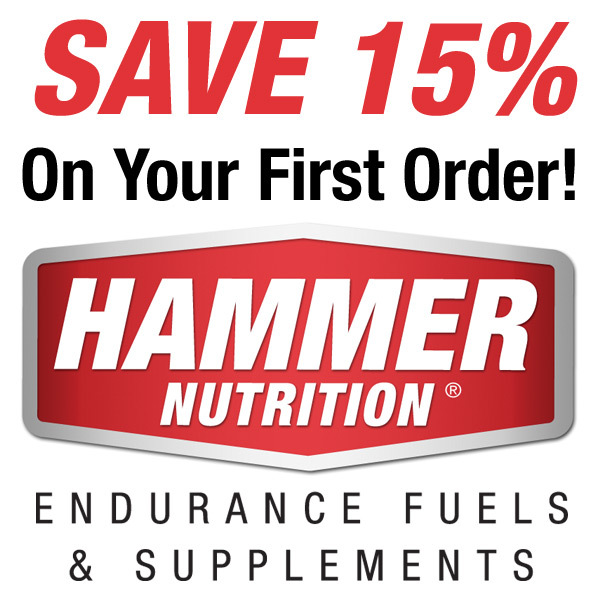 Hammer Nutrition Ambassador– I am excited to announce that I’ve been chosen as an ambassador for Hammer Nutrition. I experimented quite a bit with nutrition during 2014 and Hammer is far and away the company whose products work best for me. I really love the light taste of Heed sports drink and swear by the Endurolytes capsules. With all of the miles I have planned for the upcoming year I know that Hammer will definitely help me to get through those and recover better. 8. Tour of Sufferlandria– Anyone who has ridden a trainer or run on a treadmill in the winter knows that it can get boring. fast. Sufferfest has found a way to make sure bored doesn’t happen when you’re on a trainer. The couple videos I have done are among the toughest workouts I’ve had. Ever. I love and hate the challenge, but can’t wait to see how they help me improve in the upcoming year. Later this month, they have a 9 Day Challenge that I plan to take on. It will be horrible. I can’t wait. 9. Mileage– Since I didn’t do a year end blog post like I intended, here are my numbers. I plan to double them at a bare minimum in 2015. 10. Long Runs– Once the most hated part of any training I did, I’ve come to enjoy these. That is all thanks to the camaraderie provided by RunWell with weekly runs. I know that I can show up on a Saturday morning and have SOMEONE to run with. People are flexible in distance and pace and make sure that everyone gets in what they need/want to. It has been a really nice change to my running routine. There are lots of great people to support and challenge you each step of the way. 11. Dog Miles– When I do run on my own, some of my favorite runs are with my dogs. Where one dog is built for distance and running and I’ve not found a distance that tires her out yet, the other dog is the perfect partner for a cool-down mile (at most). They do get jealous of the other being taken on runs so I try to spread the love, but the pure joy and effortless strides they have make any run better. 12. Leading by example– I know there are lots of people in my life who will never do a triathlon and that is ok. There is so much more to this journey than triathlons. There are lessons in setting goals, taking care of yourself both physically and mentally, balancing family and work and personal interests, overcoming challenges and persevering, proving to yourself what you can do. Although I really love triathlon and what it involves, these are really the reasons I do this. 13. Strength training– I am going to try to incorporate some different types of training besides just swim, bike and run to make workout regimen. Thanks to some pretty cool bands, pull-ups in the garage are an option now. Yes, it is cheating, but cheating is better than zero. Besides pull-ups I plan to do quite a bit of core, squats, lunges, etc. 14. Downtime– Although this blog makes it sound like my life revolves around training, that is not completely accurate. The vast majority of my time is spent NOT training. 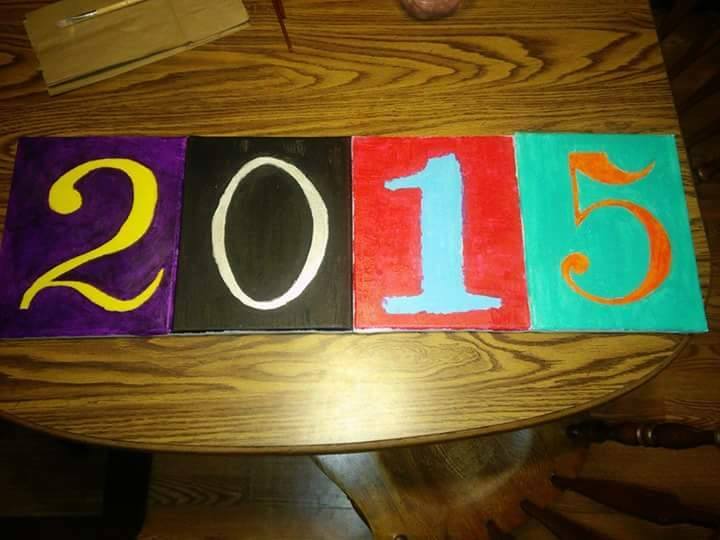 There are so many things to look forward to in 2015 that do not involve training. 15. PRs- In 2014 I earned a new PR in the 10K, Half-Marathon and Marathon, and the Olympic and Half-Distance Triathlons by default since they were my first. I plan to set a lot of new PRs this year! 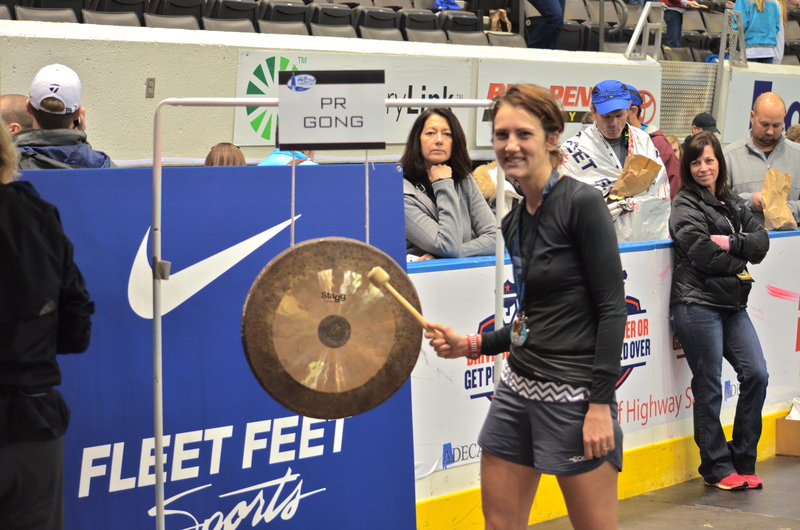 Maybe every race will have a PR gong?